On September 5, 1866, in the vicinity of Juchitán de Zaragoza in the state of Oaxaca, a skeletal battalion of the Mexican army, undermined by fatigue and hunger, sought out and formed an alliance with neighboring indigenous populations to put an end to the French battalion known as the Devil’s Tail. The indigenous peoples’ weaponry consisted of rudimentary shotguns, machetes, and slingshots, but above all their collective spirit and thirst for justice prevailed in a region where the yoke of the Spanish and French conquerors had left open wounds. The Isthmus of Tehuantepec region is rich with epic stories of resistance that spur current generations of Zapotecs and Ikoots to cling to their cultural identity in the face of often rapacious modernity. This is a region blessed with indigenous cultural diversity, fertile lands, and, crucially in the current energy context, some of the best wind conditions on Earth. Since 1993, the Mexican government has accelerated its transition towards renewable energy, necessitated by the depletion of oil reserves. Consequently, it has opened the doors to foreign direct investment, especially Spanish, to build wind farms and begin developing the wind industry in Mexico. This is a strategic industry that, under agreements such as the Kyoto Protocol and the United Nations Framework Convention on Climate Change, receives financial support from the World Bank, among others. Bearing these considerations in mind, it is easy to understand why the Felipe Calderón administration of Mexico has sought to develop its wind industry by presenting ambitious energy plans and pushing the Energy Secretariat (in Spanish, Secretaría de Energía, or SENER) and the Federal Electricity Commission (in Spanish, Comisión Federal de Electricidad, or CFE) to fulfill them. However, this institutional impulse has come face to face with an ineffective regulatory regime. On one hand, it has created incentives that have resulted in the emergence of certain irregularities, especially in regards to public bidding processes under the “open season” regimen. On the other hand, existing energy legislation prioritizes economic criteria and does not safeguard basic environmental, land, or labor rights. 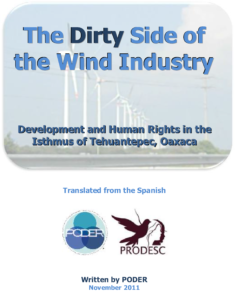 Consequently, the wind development model imposed on the Isthmus of Tehuantepec benefits businesses at the expense of communities, which in turn are subject to serious abuses. Thus, this region stands as an emblem of the dirty side of an industry that the government promotes as clean and sustainable. Clinging to their history of resistance, the Zapotec and Ikoots peoples have been organizing themselves in a growing resistance movement that seeks to defend their right to free, prior, and informed consent and sustainable development. Should the abuses persist and the opportunity to build symmetrical relations grounded in basic principles of justice is wasted, this movement has the potential to impede or even halt the development of future wind projects. The collective organization of these communities reminds us of the social and environmental costs incurred by the energy transition in Mexico. Hence, in this report we pose a basic question: wind development, yes, but under what terms and conditions? PODER and ProDESC – two civil society organizations – have partnered to propose an alternative solution to the development paradigm in the wind industry. This model seeks to articulate and implement a framework that guarantees compliance with human rights and transcends the false dichotomy between the interests of companies, characterized by the profit motive, and respect for the heritage and dignity of local community stakeholders. Once in place, this model would guarantee the free, prior, and informed participation of the communities in development decision-making processes. In addition, it would endorse the position of the community stakeholders as the political subject with the power to autonomously decide what model of development is more favorable to their interests, including the option of choosing an agricultural model, or rejecting a development model dictated from the outside. Ultimately, the objective is nothing more than to guarantee social and environmental sustainability in the Isthmus of Tehuantepec.